← Stop. Look. What’s that Sound? 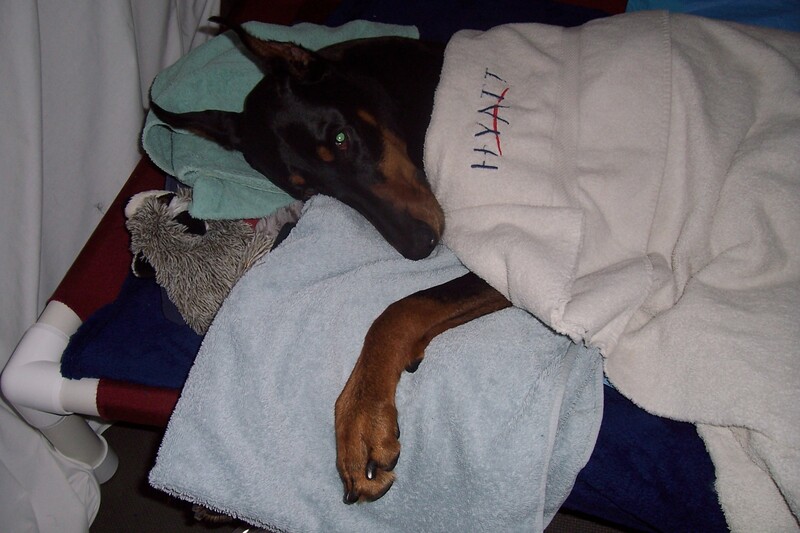 In April 2009, our Doberman Lena had a dorsal laminectomy to reduce a severe spinal compression* in her neck. The surgery was done at Cornell University. The vets were surprised at the severity of the compression since Lena was able to walk and move fairly well prior to the surgery. With her condition they would have expected her to be paralyzed. The diagnosis process had lasted two years and was complicated by the fact that her symptoms were subtle; one blood test had shown exposure to Rocky Mountain Spotted Fever and treatment made her temporarily better. In addition there wasn’t an adequate MRI machine within 5 hours of where we live. The diagnosis came shortly after an MRI facility came to our area. The vets had warned us that Lena would most likely be completely, but temporarily, paralyzed after the surgery. And she was, in all four limbs. Lena’s paralysis lasted 52 days, a significantly long time. While most dogs recover in less time, there are plenty of dogs who take longer to recover. Case studies can be found online. Lena spent a week in Cornell’s ICU before we brought her home. Our plan was to keep her home and take her daily to a rehab vet during the week. We quickly realized that caring for her at home was going to be extremely difficult. The paralysis forced Lena’s legs to stand out stiffly and straight from her body. She could not bear any weight on her limbs. To move her we had to lift her and the stiff legs made this very awkward. Just negotiating a doorway while carrying her was a strategic nightmare. My husband has back problems so most of the lifting was left to me. I managed in spite of Lena’s 53 pounds. (I gained a lot of upper body strength!) We changed our plans and decided it would be best to board Lena at a local rehab vet from Monday through Friday and we would bring her home on weekends where we continued her therapy and care. We gained a new appreciation for what it meant to be quadriplegic and what it takes to rehab a dog. one of our doors. 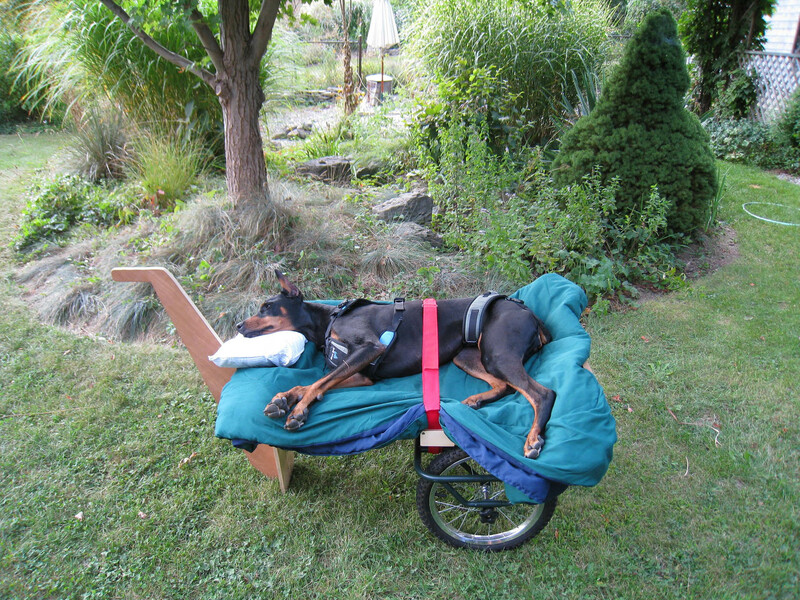 To get Lena in and out of the house, my husband converted a canoe carrier into a cart. 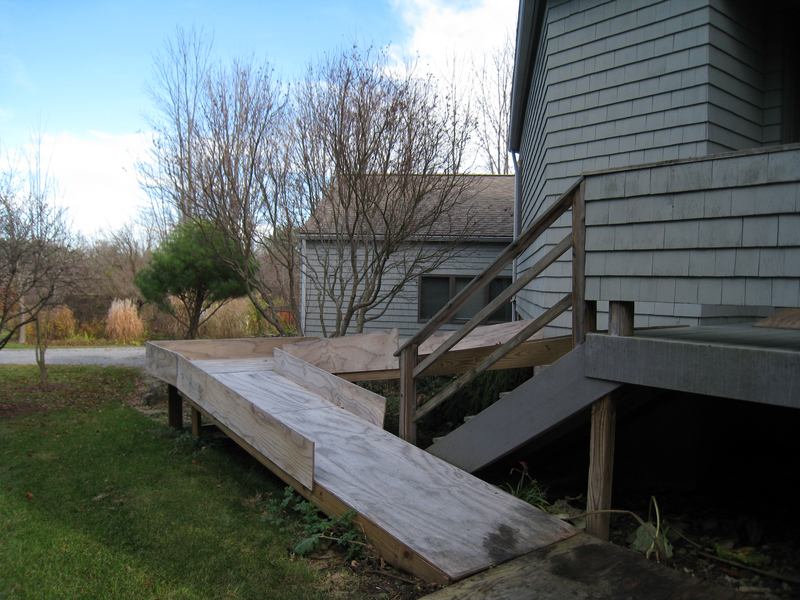 The ramp was built with a very low side to prevent the wheels of the cart from going over the edge. Railings weren’t used to make turns easier with the cart. A Hoyer lift, on loan from the vet, assisted Lena to relieve herself outdoors. Indoor considerations included finding a comfortable place to keep Lena, an appropriate bed and a place to keep all of the towels, bed pads, medications and cleaning supplies. Everything I had read about post-surgical recovery for a dog suggested “crate” rest for the dog. Lena’s rigid legs made it impossible to place or fit her into a crate. A crate or ex-pen was unnecessary due to her paralysis. So all we needed to do was find a quiet room and create a bed for her. After much experimentation we found that the perfect bed consisted of low layers on the floor. On the bottom we laid a piece of plastic, followed by a thin foam outdoor dog bed with removable nylon cover and on top of that we had 3 or 4 layers of pieces of an old quilt. I took an old king size quilts and cut it into four pieces. I sewed the pieces to create multiple mini quilts that were easy to wash. Bedding was washed at least once a day. 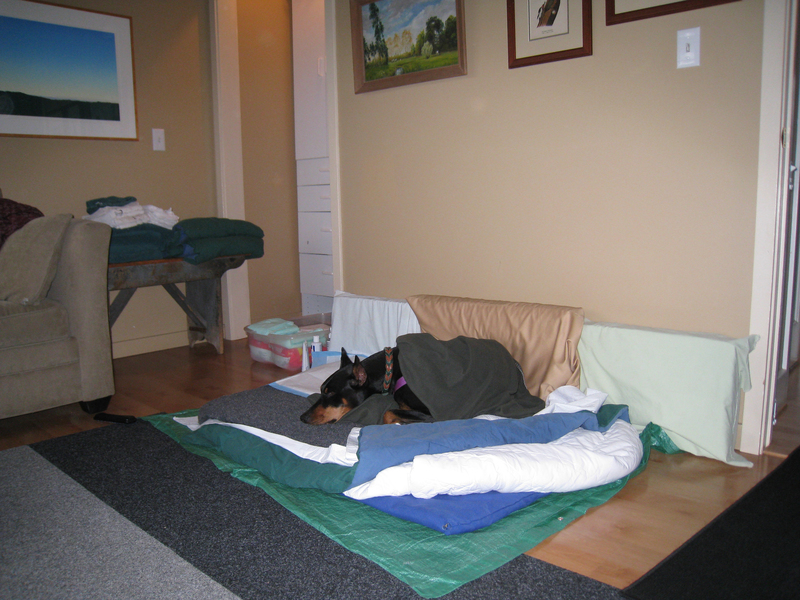 On top of the quilts I used a twin size waterproof washable bed pad and a layer of thick medical fleece made for pets. We used disposable waterproof underpads as necessary. We later tried a bed made for incontinent dogs that worked very well. Paralyzed dogs often have difficulty urinating and may need to have their bladder expressed. They are more susceptible to urinary tract infections that exacerbate and complicate the situation. 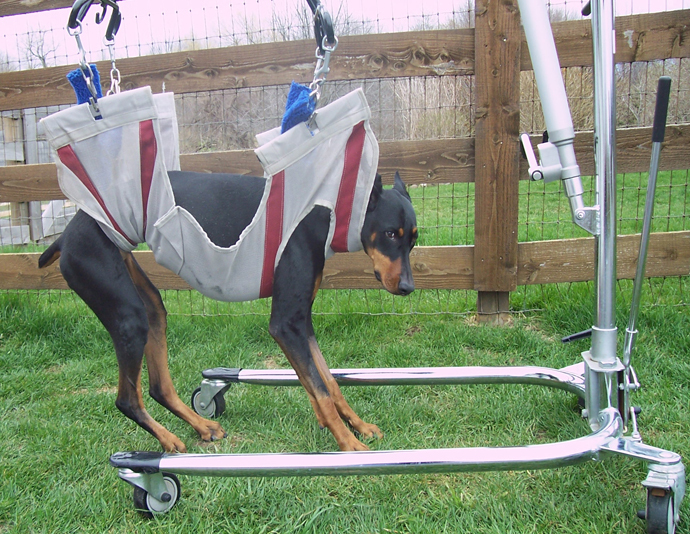 Paralyzed dogs are often incontinent or you may need to help them eliminate in a prone position. Lena was quite vocal when she needed to go and if we couldn’t get her out in time, one of us would have to hold up her rear end and place a disposable underpad under her to collect the urine. Washable bed pads and plastic can also be used but are harder to negotiate with a large dog. Once in awhile I was able to get Lena in an upright position so that she could relieve herself on a large piece of plastic tarp. This was never easy and timing was always critical. I would then empty the tarp outdoors and wash the tarp in the washing machine. Extra towels, bedding, and underpads were stored close to Lena’s bed. There was no need to use a cabinet, a small bench was sufficient for these items. Medical supplies, a TENS Unit and a log to track medications and Lena’s progress were also kept in the same room, but placed on a shelf out of reach of our dogs. Lena’s condition improved drastically once she was ambulatory, but she was still shaky and prone to falling or slipping. At that point, we covered sharp edged furniture with furniture blankets and used multiple rubber-backed throw rugs to aid in her mobility. It’s been nearly two years since the surgery and Lena has gained back nearly all of her mobility. She can climb up and down stairs on her own and takes long walks every day. We are thrilled to have a happy dog again. *Note: Doberman’s and a few other large breeds are more prone to Wobbler’s, but this was not the case for Lena. Her compression (or herniation) was not due to an injury either, it was most likely a condition that developed slowly over time because of a weakness in the disc. We are grateful to Dr. Kristin Browne and her staff at Thera Vet Acres in Penfield, NY for their excellent work and compassion. My favorite part of the week was picking Lena up on Fridays to take her home. Dr. Browne often helped put her in the car and then proceeded to give Lena a hug and kiss before letting her go home! This entry was posted in Special Needs and tagged Dog, interior design, pets, Special needs dogs, Surgery. Bookmark the permalink. Beautiful, inspirational story! Lena is truly a miracle dog!